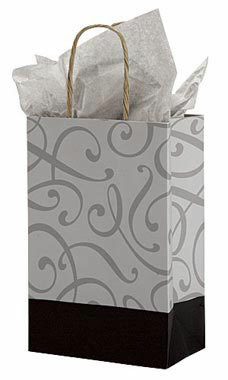 Your customers will love carrying out their purchases in our Black & Silver Swirl Paper Shopper. These Platinum bags feature a complex Platinum design and solid black bottom to polish off the look. Pair these bags up with our coordinating packaging options such as our tissue paper, ribbons, or bows and transform ordinary paper shoppers into elegant, classy gift bags. Sold in cases of 25.